You’re serious about working out, so you’re going to make it easier on yourself. No more paying for gym memberships and driving across town to workout – you’re going to build a gym right inside your home. You can customize your home gym to help you meet all your personal fitness goals, but here are the six pieces of equipment that every home gym must have. One distinctive feature of a gym is the huge mirror that takes up the entire wall. While you don’t need to mirror your entire home gym, don’t forget this important piece of equipment in at least some healthy size. It’s very important to be able to see yourself, and not just for vain reasons. A mirror helps motivate you, and it helps you correct your own form and technique. It will also help recreate the atmosphere of a real gym. If you don’t have a huge piece of gym equipment that includes a pull up bar, it’s very easy to install one for yourself in the doorway of your home gym. A pull up bar can be used in many different ways to work out your arms and your back. It’s a tired but true staple of any gym, so be sure to get one in your home facility, too. This goes without saying, but we’ll say it anyway: you need to have dumbbells in your gym. 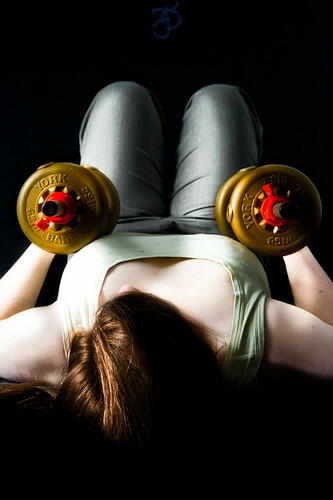 Weights are the most effective tools you can use to enhance any workout. They’ll help you tone up any part of your body, and they can be used in so many different ways. Their sheer versatility is one reason you need to have them. Varying weights can be used for many different purposes, and anyone who visits your home gym can take advantage of them. A box step is another very versatile piece of equipment. It’s so simple, but it will help you add another level of intensity to any workout you do. Use it to do step aerobics, or just as a tool to help you add dimension and depth to your lunges and weight lifting. Unless you’re going to run laps around the room, you’re going to need some workout machines, or one machine at the very least. Choose a type of machine that you enjoy or will want to use the most. Don’t buy a piece of equipment that you’re unsure of because they’re expensive, and you don’t want a huge piece of machinery taking up dead space. A treadmill is a classic favorite that you can’t go wrong with, or you might like to spice things up with an elliptical or rowing machine. Whether you buy a large floor mat to permanently place in your workout room, or if you purchase a small, foldable yoga mat, you need some type of cushion for the floor. When you’re doing stretches or other floor exercises, you don’t want to be on a hard surface. A floor mat will make things a lot easier and much more comfortable. Ashley Cole is a stay at home mother who is obsessed with working out. She also loves to write and she often turns to the internet when she needs any content advice or essay editing done. She is also very proud to be able to help her children work on their application of admission for college. This entry was posted in Fitness, gym equipment, home gym and tagged home gym equipment by Russell Jensen. Bookmark the permalink.